The Graduate School has announced the winners of two prestigious faculty awards traditionally awarded during Commencement season. Jennifer Tank of the Department of Biological Sciences was selected by a faculty committee to receive the 2013 James A. Burns, CSC Award, and Kathie Newman, of the Department of Physics, was selected to receive the 2013 Director of Graduate Studies Award. Both awards will be presented at the Graduate School Awards Dinner on Friday, May 17. Tank and Newman will both be recognized as well at the Graduate School’s Commencement ceremony the next day. Nathan Hatch, President of Wake Forest University and former Provost as well as Vice President of Graduate Studies and Research and Dean of the Graduate School at the University of Notre Dame, will deliver the Commencement address. As the citation for her award states, Tank is renowned as a dedicated and generous mentor. She provides her students with rigorous scientific training—for example , training them in the use of cutting-edge isotope tracer methods to measure energy and material flows in aquatic ecosystems. Tank also sets high expectations for her students in publishing and presenting their research, and in securing grants. They typically have several publications in top-tier journals before they even defend their dissertations. Tank’s students have garnered many awards and honors. Since her arrival at Notre Dame in 2000, five students have won nationally competitive NSF doctoral dissertation improvement grants, and two of her students have won the Graduate School’s highest award, the Shaheen award, with two others selected as the department’s Shaheen nominee. After Notre Dame, Tank’s students have gone on to well-regarded career and postdoctoral positions at such agencies and universities as the Environmental Protection Agency; Oak Ridge National Laboratory; Aarhus University in Denmark; Colby College; Indiana University, Bloomington; Loyola University-Chicago; and Michigan State University. A zoology major at Michigan State University, Tank went on to Virginia Tech to earn her doctorate in ecology, also completing a postdoctorate there. 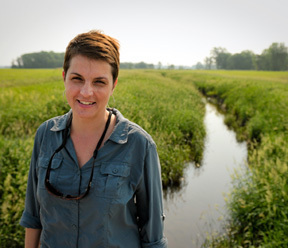 Now a full professor at Notre Dame, she is also the director of the University’s new Linked Experimental Ecosystem Facility as part of the Notre Dame Environmental Change Initiative. Tank’s research focus is on nutrient cycling in stream and river ecosystems. As the author or co-author of more than 100 peer-reviewed publications appearing in scientific journals and over 200 abstracts reflecting presentations at scientific meetings, she is in widespread demand for her expertise on the health of aquatic ecosystems worldwide. Kathie Newman of the Department of Physics has been awarded the 2013 Director of Graduate Studies Award. Newman has served as the department’s director of graduate studies (DGS) since 2003. Her role encompasses all duties related to graduate student administration, including advising, admissions, and teaching assignments. Newman has been proactive in bringing about a number of important changes to the Physics graduate program, which is one of the largest programs at the University. Those changes include curricular innovations; the development of a summer course designed to prepare new graduate students for the required preliminary exams and to be better teaching assistants during the academic year; an emphasis on students’ professional development; and increased faculty mentoring of graduate students. The latter initiative includes developing a set of guidelines and procedures to help standardize this important aspect of graduate training. Newman has also worked with the departmental recruiting committee, which developed recruiting tools that are models for doctoral programs across the University. Along with Wayne, Newman has held annual lunchtime meetings with groups of graduate students to gather their feedback on the program and their recommendations for improvements. Newman also heads up the departmental admissions committee. In addition to her role as Director of Graduate Studies, Newman has continued to teach full time and advise two Ph.D. students of her own. 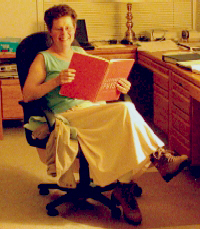 Newman received her Ph.D. from the University of Washington. Her research interests center on the statistical mechanics of semiconductor systems. Past work included the study of the interplay between elastic interactions and the phenomena of ordering or phase separation in lattice-mismatched alloys. Current investigations include the use of Monte Carlo and molecular dynamics simulations to understand complex systems. Originally published by Mary Hendriksen at graduateschool.nd.edu on May 08, 2013.